The Sonoma County Winegrowers is proud to recognize Dry Creek Valley grape grower Richard Mounts with its 2016 Viticulture Award of Excellence. Richard has been a tireless supporter and advocate of grape growing and the Sonoma County Winegrowers for the past two decades, always answering the call to serve and has done so with leadership, knowledge and passion. He has donated countless hours over the years to promote grape growing, ensure there’s a marketplace for our county’s grapes, and provide his viticulture and farming expertise to our wine community here in Sonoma County. Richard is a member of the Sonoma County Winegrape Commission Board of Directors and its Executive Committee, he has served as Commission Board Treasurer an d is a longtime member of the organization’s Marketing Committee. Richard has hosted important media and influential trade representatives to his family’s vineyard to educate them about grape growing and showcase his family’s legacy in Dry Creek Valley. In 2015, the Sonoma County Winegrowers featured Richard as their first grape grower in their national advertising campaign, “Sustainable Agriculture in a Glass” that ran in Food & Wine Magazine, Wine Spectator, Wine Enthusiast, and other publications. In addition to his involvement with the Sonoma County Winegrowers, Richard has been very active in the local Sonoma County and California agricultural communities, including 24 years on the Board of the Sonoma County Farm Bureau (served as Board President from 1997-1998; member of the Executive, Budget & Finance, Building, and Natural Resources & Environment Committees); 25 years on the Board of the Sotoyome Resource Conservation District (now Sonoma RCD); and Advisory Task Force member on California’s Pierce’s Disease/Glassy Winged Sharp Shooter Board. 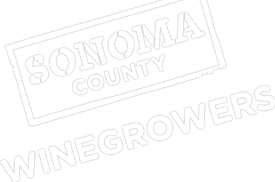 Sonoma County Winegrowers annually presents the Viticulture Award of Excellence to recognize individual grape growers or grape growing families who have made significant contributions to the Sonoma County Winegrowing community and the greater Sonoma County Community. The award was presented to Richard Mounts during Grower Seminar, BBQ, and Tradeshow last Friday, June 3, including special recognition with a State of California proclamation presented by representatives of the State legislature and another proclamation from the Sonoma County Board of Supervisors. Congrats Richard!